Takeuchi Mfg. began in 1963 and has been a pioneer in the compact equipment industry ever since. 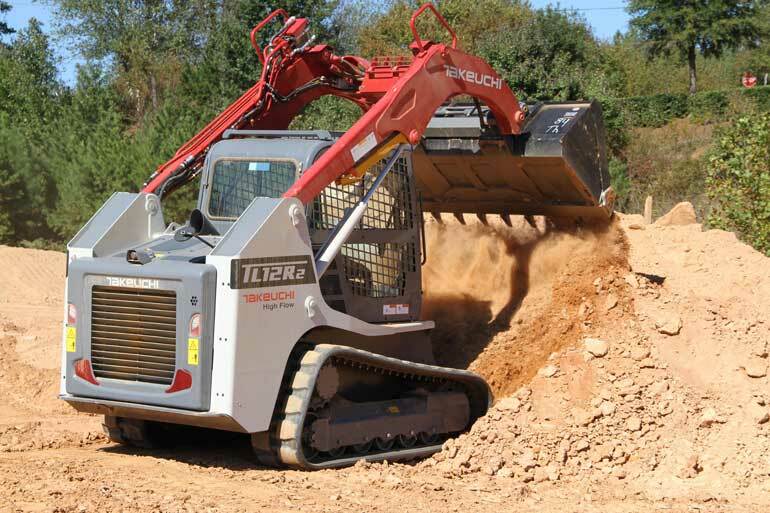 Takeuchi developed one of the world’s first compact excavators in 1970, and the company’s innovation continued again in the mid-’80s with the introduction of its first compact track loader. Takeuchi compact track loaders are designed and engineered with power, strength and maneuverability, says the company, providing a high level of quality and performance. Each of the company’s compact track loaders features a two-year, 2,000-hour full machine warranty. Now available in both radial- and vertical-lift configurations, Takeuchi can meet the needs of a wide range of customers. Each Takeuchi track loader is purpose built and features a unique undercarriage design that features model-specific components that are matched to each specific platform for greater durability. A fully welded track frame incorporates a unitary design with multiple cross members for superior strength and rigidity. Double reduction planetary drives produce excellent power for torque and performance in the most demanding applications. The operator’s station on Takeuchi track loaders are spacious and feature a deluxe high back suspension seat with multiple height adjustments, placing the operator in the optimum position to see the attachment edge. Pilot-operated joystick controls are utilized to control all loader and travel functions. Their precision and responsiveness, due to the low effort controls, reduce operator fatigue, says Takeuchi. Check out more 2017 track loader specs here.